We’ve been looking for a second chair for our living room for a very long time. We found this in Just Antiques, on North Main Road here in Pune. They specialize in pieces made from repurposed wood. This piece is aged teak. The back is a recycled piece of interior paneling or carved window screening. The origin of the legs and seat platform are less discernable. When we get home we’ll lose the egregious purple foam cushion. I’m now on the lookout for a length of embroidery, a small weaving or lightweight rug that can be used to cover a sprung cushion. I think that a very thick knife-edge piece with a center button would look far better than the slab of purple cheese that’s there right now. Perhaps next week’s trip to Kerala and the beach will turn up something appropriate. 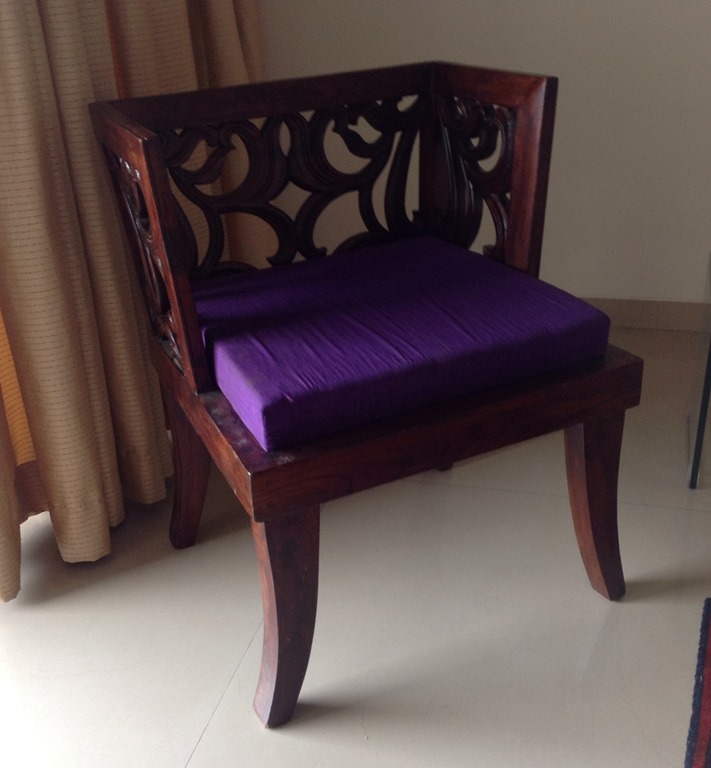 We also got a small shelf/coat rack at Ra in Kalyani Nagar. That is destined to go behind our front door, also in the living room. It’s a simple wood shelf, with antique cast iron side brackets sporting pierced ornamentation, and a wrought crossbar below the shelf to which is attached four large wrought coat hooks. We have no front or reception closet, and it will be nice to have a place to hang guests’ coats when they visit. I do not show pix today because it is securely wrapped for shipment, and I don’t want to undo its bubble-wrap cocoon.